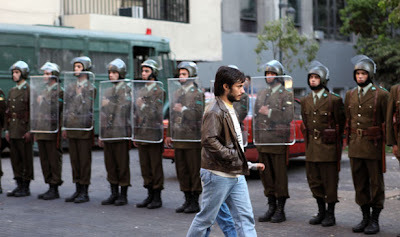 Pablo Larrain’s latest film forms the third part of a trilogy that started in 2008 with Tony Manero, set in Santiago in 1978 with its deserted streets, shuttered shop fronts and walls covered with painted over posters, the director illustrated how working class Chileans retreat from the realities of life in a film he described as an allegory of life under the Pinochet regime. The penultimate film was Post Mortem (2010) a movie that does a great job of portraying its story as a metaphor for the missing in Chile. A part of history that evil people and their British friends attempted to sweep under the carpet along with a multitude of corpses. 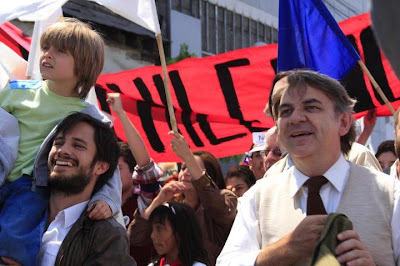 The third and final part of the trilogy is No (2012) where Larrain asks critical questions about the fate of Chile, propaganda and the commercialization of politics. The story deals with the 1988 plebiscite that led to Pinochet being forced to relinquish power. Coincidently it was the USA who had helped put the man in power in the first place who insisted that the General ‘appear’ to put his house in order by allowing the people to choose if he should go, or stay in power for further eight years. 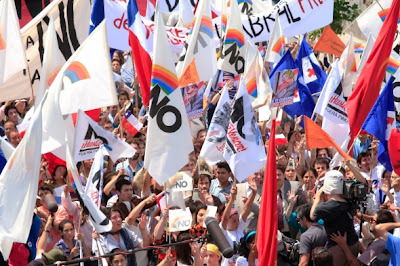 With the fascist junta imagining themselves immune, well they did have complete control over the media along with the apparatus to fix the result, and the opposition party’s declaring that they intended to boycott the referendum, it was assumed that Pinochet would be there for ever. 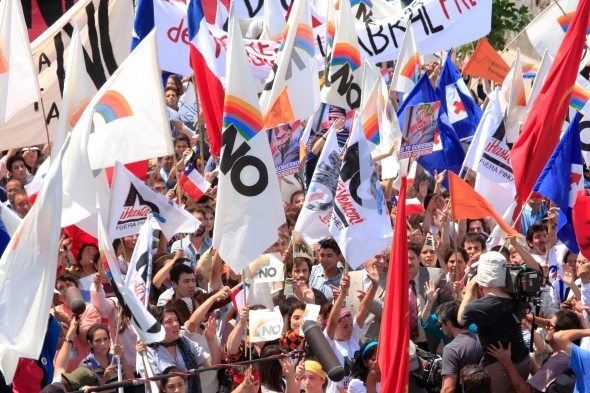 But with a change of mind, that involved forming a united front involving 16 socially responsible political parties, the opposition decided to fight for a ‘No’ vote. 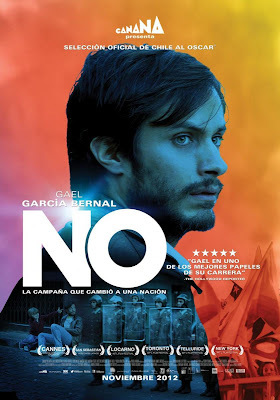 To this end they invited a successful advertising executive Rene Saavedra (Gael Garcia Bernal) to come up with a campaign that would persuade people that Chile’s future is worth registering a ‘No’ vote for. But Saavedra is unsure, his boss Lucho Guzman (Larrain regular Alfredo Castro) works for the ‘Yes’ campaign while his estranged wife Veronica (Larrain’s wife Antonia Zegers), who he is still in love with and the mother of his young son Simon, is a left wing activist. 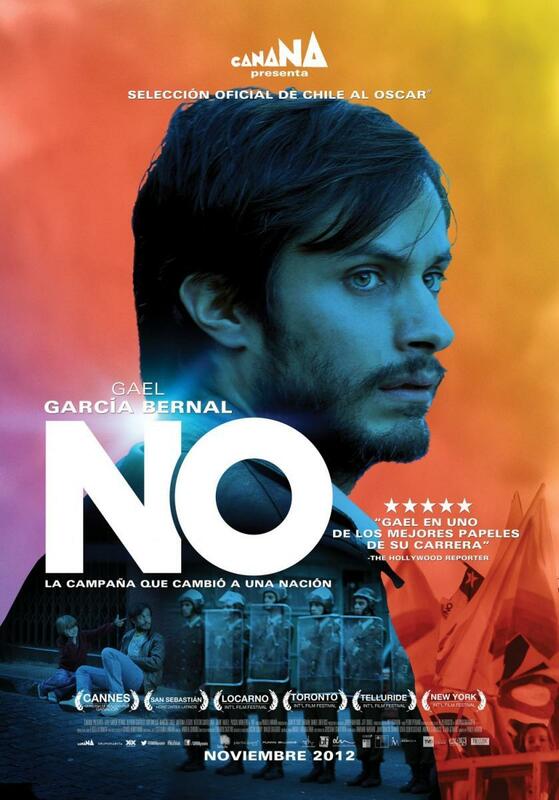 The No campaign gathers momentum. The film demonstrates what can be done to change the political status quo when like-minded people come together to oust a despot and his supporters. Strangely enough it reflects what’s beginning to happen in our own green and pleasant land with the formation of the People’s Assembly that is gathering strength boosted by Ken Loach’s latest film The Spirit of 45 (2012). Its aims are to have a coherent political grouping to fight austerity and give ordinary people a voice now that the Labour Party have deserted its core support. With the Con-Dem coalition moving ever further to the right and placing their support firmly behind the privileged classes, in turn ignoring the welfare of the most venerable people in this country, its not before time. Anyway I’ve diversified; Larrain’s fourth directorial outing is a well-acted documentary style movie that’s filmed using a ¾ inch Sony U-matic magnetic tape which was widely used by the Television news program’s in Chile in the 1980’s adding a slightly washed out coloring which along with its 4:3 aspect fit’s well with the archive film included and adds realism to a film that’s less dark and more assessable than the previous parts of the trilogy but certainly no less compelling. Rene Saavendra walks the line.